The Abandonment of the Jews received enormous critical and commercial attention when it was first released in 1984, appearing on the New York Times bestseller list for five weeks as well as on its Best Books of the Year list. A selection of the History Book Club and the Jewish Book Club, it has sold over 100,000 copies in its various editions. In this landmark work, David S. Wyman argues that a substantial commitment to rescue European Jews on the part of the United States almost certainly could have saved several hundred thousand of the Nazis’ victims. 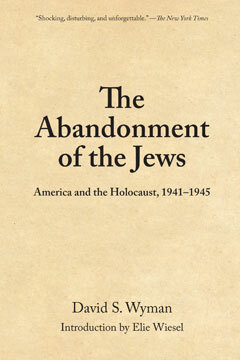 Widely considered to be the definitive book on the subject, The Abandonment of the Jews won the National Jewish Book Award, the Anisfield-Wolf Award, the Present Tense Literary Award, the Stuart Bernath Prize from the Society for Historians of American Foreign Relations, and the Theodore Saloutos Award of the Immigration History Society, and was nominated for the National Book Critics Circle Award. This edition includes a new preface by the author discussing the ongoing controversy aroused by the book since its original publication.